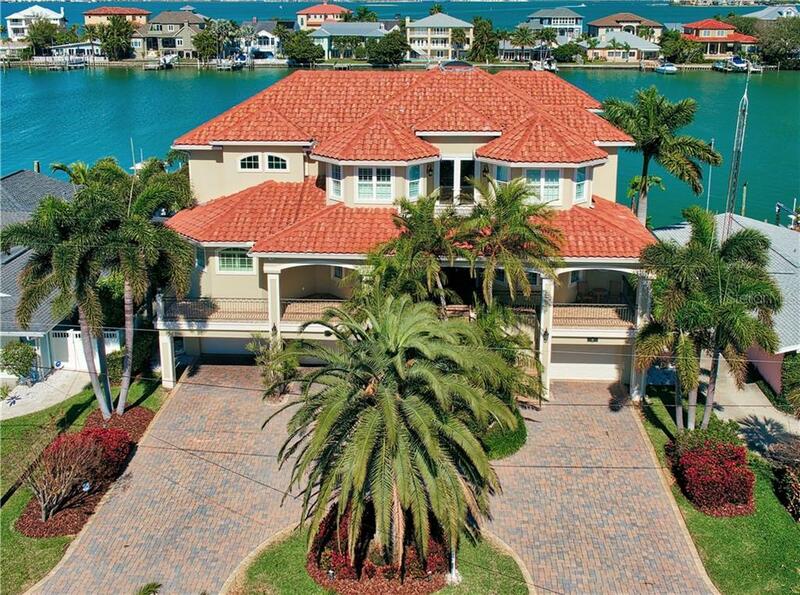 Your family will love all the extraordinary amenities of this magnificent custom home overlooking a protected channel opening to Clearwater Harbor. Thereâs space for boats at the dock which includes a 32000 lb. lift 16000 lb. lift and 240 volt 100/50/30 amp pedestal. Or maybe itâs time for a dip in the heated pool with spillover spa. Entertain using the two-story living room and dining room with travertine floors. The family room with cozy fireplace and sliding doors to a covered waterfront terrace is open to a breakfast area and the gourmet island kitchen with maple cabinets granite counters and stainless steel appliances including a Wolf six burner gas cook top double ovens and a Sub Zero refrigerator/freezer. The living level master suite has a French door to the terrace his and her walk-in closets and an Okra limestone luxury bath with his and her vanities whirlpool tub walk-in shower with dual heads and enclosed water closet and bidet. There are four bedrooms and three baths on the upper level along with a childrenâs playroom offering sliders to a waterfront balcony. The ground level includes enormous open garage space workshop locked closet and an open carpeted rec area with sliding doors to a pool patio. Additional features include an office with built-ins and wood floors powder room laundry room custom crown molding plantation shutters central vac and elevator to all levels. This mainland location is just minutes from nearby shopping dining and bridge to the Gulf.